A Ukrainian embroidered towel [rushnyk] is spread before the altar on which the couple will stand. The use of the rushnyk symbolized the hope that the newlyweds will never face poverty or "stand on a bare earthen floor". After the ceremony, the couple will use the wedding rushnyk where it is often displayed around an icon or used for the couple's first Easter basket (an elaborate affair in Ukrainian tradition). Tradition dictates that whomever steps on the towel first will be the head of the family. Of course, Ukrainian folk wisdom declares that the man is always the head of the family--but it is the woman that is the neck that turns the head! The starosty are members of the bridal party (the elders), usully two friends or family members (one from each side and, often-the godparents) who have a special role in the celebration. They preside as official witnesses, often as masters of ceremony. In the distant past and days of arranged marriages, the starosty were the official matchmakers. 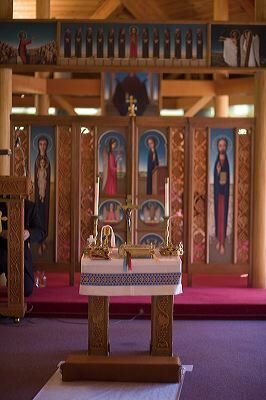 Today, the starosty’s responsibilities are limited to leading the wedding processional, carrying the icons of Jesus and the Virgin Mary into the church. These icons will accompany the couple to their first home together and will be placed in a prominent place, symbolizing the spiritual center of the household. During the ceremony, the hands of the bride and groom are joined together with an embroidered cloth, [rushnyk] to signify their union. The priest then leads the bound couple around the tetrapod [small altar] three times (for the Holy Trinity). This procession symbolizes that marriage is a never-ending journey and that the journey should be led by Christ. These are the first steps the young couple takes as husband and wife. Traditions and rituals bind centuries together. For a wedding with a unique Ukrainian flair, Soyuzivka can help you design a traditional Ukrainian wedding celebration. Today, many brides choose to incorporate a variety of customs, as well as delicious traditional foods into their celebration. In Ukraine, a wedding was a three-day celebration. Having a wedding at Soyuzivka treats your guests to an entire weekend of festivities. The origin of the Ukrainian marriage ceremony is steeped in mystery and rituals of Eastern rite Christianity. We are happy to share some of these with you. A few hours before the couple leaves for the church, the bride and the groom join both sets of parents at the home of the bride’s parents for the Blahoslovennya—or "blessing." The young couple kneel on an embroidered ritual cloth [rushnyk) before their parents. Usually the starosty ( the elders) hold the icons of Jesus Christ and the Virgin Mary, which are draped with a rushnyk. The parents bless their children, wishing them a joyous, prosperous and healthy life together. The parents hold the korovai [ritual wedding bread].It is here that the two families officially become one. Soyuzivka can help you obtain rushnyks, icons and korovais. In Ukrainian-American churches, the Ukrainian language still is often used during the ceremony. Unlike most western marriage ceremonies, in the Ukrainian tradition, the father of the bride does not "give away" the bride. 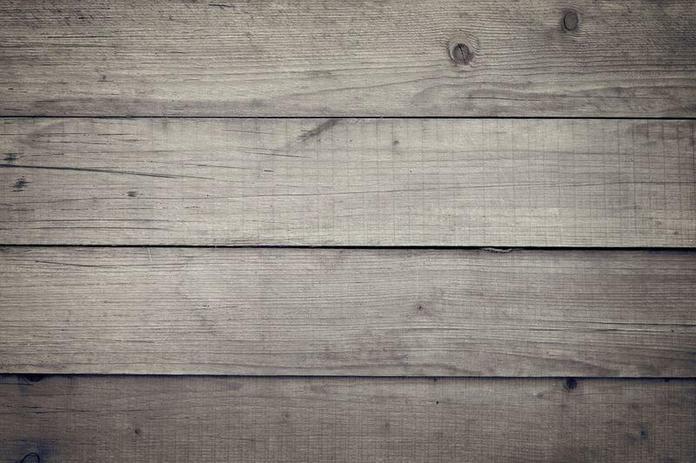 Historically, equality and teamwork has been a century-old tradition. The Ukrainian bride and groom enter the church together arm-in-arm as willing and equal partners. The entire ceremony, with the exception of the sermon, will be sung rather than spoken. St. Augustine once said that those who sing pray twice—a statement Ukrainians have taken to heart. During the Betrothal, the priest meets the young couple at the rear of the church and the ceremony begins. Befor entering, the bride and groom affirm to the priest that they are both entering into this union of their own free will. The priest then blesses the wedding bands and places them on the fingers of the bride and groom (traditionally on the right hand). At this point, the priest takes both their hands and leads them to the altar--symbolizing that God is leading them into matrimony. The couple each take three sips ( for the Trinity) from a silver goblet, the common cup. This shared cup of wine reminds us of the miracle at Cana and symbolizes the oneness of life-- a life which must be shared equally by both--in hardship as well as in joy. Candles are given to the couple to be held throughout the service. They symbolize that Christ is our beacon of light. A beautiful and sacred segment of a Ukrainian wedding ceremony is the Crowning. The bride and groom place their right hands on the gospel, exchange their vows and become married in the eyes of God. 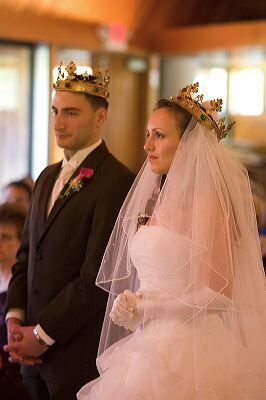 Crowns are placed or held above the heads of the bride and groom by their bridal party. The crowns symbolize that they will be the king and queen of their own family kingdom--ruling side by side. In Western Ukrainian tradition, wreaths, woven of myrtle or periwinkle substitute the crowns. They are a symbol of love, purity and fertility. Modern day brides choose whatever their preference. The newly married couple walks out of the church into the world as husband and wife to the choir and assembly all singing "Mnohaya Lita" (MNO-ha-ya-Lee-ta), "Many Happy Years." This will be sung throughout the reception, as well. Ukrainian wedding receptions begin with a ceremony welcoming the bride and groom into the community at the entrance of the reception hall. The bridal party has been announced and is seated. The parents and starosty meet the newlyweds at the door with a tray of symbolic gifts: bread, salt, honey and wine. Bread represents nature’s bounty, salt is a necessity of life, honey-the sweetness of life and wine -- prosperity. The newly-formed families unite in a toast. Only then, does the master of ceremonies announce the bride and groom into the hall. 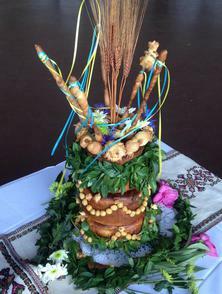 The korovai is an intricately woven traditional wedding bread that is steeped in symbolism. 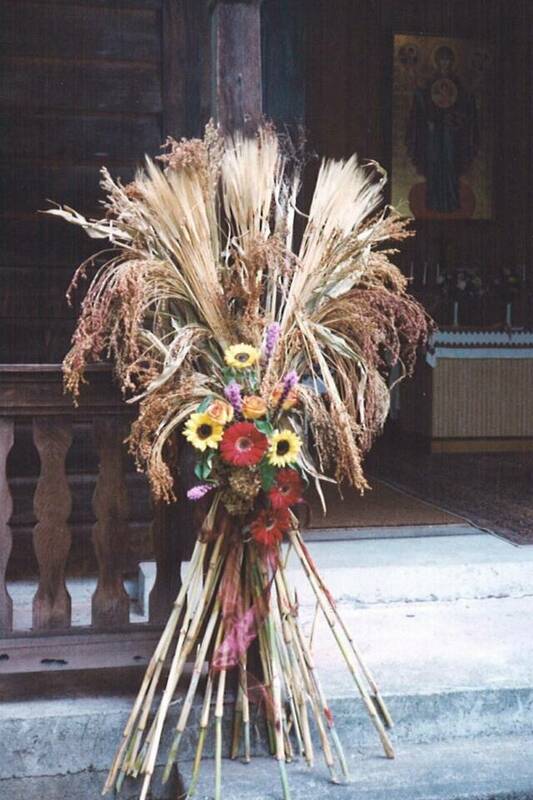 In Ukraine, it took the place of a wedding cake, however modern brides often choose to have both. In the olden days, it was baked by all the village women as an expression of support for the newlyweds. The women would sing wedding songs and share their marriage advice with the bride. The korovai is adorned with ornaments of baked dough: two doves to represent the couple, pine cones symbolizing fertility and other ornaments to represent family and friends. 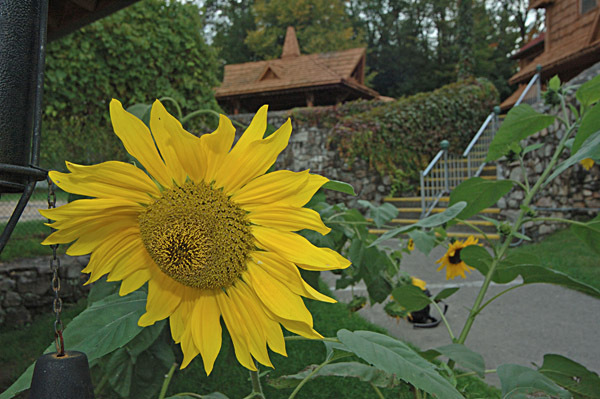 In the center of the korovai is a "derevo zhyttia" (tree of life), signifying life, love, hope, and the building of a new nest. The entire arrangement is surrounded with a wreath of periwinkle, a symbol of love and purity. The korovai is displayed in a prominent position at the reception on an embroidered tablecloth. Periwinkle [barvinok] and myrtle [mirta] are braided together into garlands,. Other embellishments-- wheat, poppies, daisies cornflowers and colorful ribbons adorn the korovai. Ukrainians sing at all celebrations, especially happy ones. Throughout the entire time of the reception, guests will get up, raise an toast and begin singing "Mnohaya Lita. ", which means "many years." Today, most brides and grooms are dressed in a white wedding dress and black suit. Some Ukrainian elements are sometimes integrated into their clothing. For example, it is popular for the bride to wear a bridal headpiece in the shape of a vinok or wreath. Some brides choose white ribbons to replace the traditional veil. Besides the bride's headpiece, many brides opt for embroidered elements on their gowns and the bridal party's shirts. The flower girls often wear Ukrainian blouses or embroidered dresses. Ukrainian elements can be adopted into the theme of the wedding through the use of flowers. Wheat, sunflowers, poppies and other field flowers are used in the floral design. Soyuzivka can suggest a florist that can assist you with all of your design needs. Music is an essential part of every Ukrainian wedding. Ukrainian LOVE to dance and sing. Most modern couples still opt for a live band which can play Ukrainian folk and dance music as part of their repertoire. Sometimes, a player on the tsymbaly or a bandura [traditional Ukrainian instruments] joins the musicians. Many couples choose processional music to be played by the bandura (string instrument like a lyre) and sopilka (flute) for a Ukrainian flavor. When the couple enters the hall, the musicians usually begin a traditional Ukrainian wedding march. Soyuzivka can suggest many popular Ukrainian-American bands at a variety of price ranges. During the evening’s festivities, the band will roll into a few bars of a lilting Ukrainian tune and young and old will suddenly swarm the dance floor to form a large circle. Younger, more agile guests start dancing the kolomeyka, a spirited Ukrainian toe-tapping dance that features a medley of leaps, kicks, and spins. Now we know where breakdancing got its start! Even the bride and groom will participate. Guests will be wowed with the spectacular dance performance. Some couples chose to hire a few Ukrainian dancers to put on a special show for their guests. Soyuzivka can put you in contact with these performers as Soyuzivka is home to the Roma Pryma Bohachevsky Dance Academy . Superb and expert performers are Syzorlyli from New York and can be found at www.syzokryli.com. This tradition is experiencing a resurgence. Toward the end of the evening, the bride will be seated and her mother and godmother will remove her veil and replace it with a shawl (usually colorful and flowered), symbolizing her leaving her "maiden" status and becoming a married woman. Married woman, by tradition, cannot were "vinoks" or wreaths. Special folk songs were sung by the women guests as the ceremony continued. One by one each bridesmaid puts on the veil and dances with the groom. This symbolizes the wish that each maiden will also find her life partner. Ukrainians love desserts and are accomplished bakers. Tortes (multi-layered, rich, elegant cakes made with ground nuts or bread crumbs instead of flour are filled with a variety of icings and fillings.) Many modern brides choose to have a "torte" table at the reception. Usually around midnight, a snack "perekuska" is served for everyone at the wedding. This typically consists of Ukrainian bigos (sauerkraut), varenyky (filled potato dumplings), Ukrainian sausage, holubtsi (cabbage rolls) with rye bread or rolls. This snack is set out in a buffet style for guests to enjoy before they depart for the evening. Soyuzivka prepares a delicious traditional midnight buffet. By Ukrainian tradition, weddings are a three-day affair. On the day after the wedding, the bride's parents host a luncheon for the guests. The purpose of these "Popravyny" is to greet the bride and groom on their first day as a married couple. This tradition, with a modern twist continues to this day. In keeping with this custom, Soyuzivka can prepare a delightful brunch for guests the next day after the wedding with brunch selections to include Ukrainian traditional foods.